Pooja Kachhi resides in Bachhlon village which is located in Sagar district of Madhya Pradesh. She belongs to a very poor family. Her economic condition was not very good. Her parents were daily wage laborers and sometimes they work agriculture.Pooja is a very promising student. 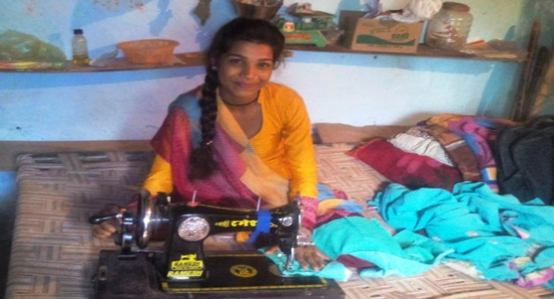 Pooja could not be able to continue her studies because it is difficult for her parents to meet the educational expenses. A team of moblizers met her while doing the outreach activity at her village and shared about the free skill training provided by Don Bosco Tech. Pooja came to the centre to know more about the program and its entitlements. The trainer described her deliverables of the program and also said, “Don Bosco Tech will assist her to find a placement after successfully completion of the training.”After counseling, she decided to enroll in the SMO course. During the training, Pooja was a good learner, punctual and very passionate about the domain. She also participated in a number of programs organized at Don Bosco Tech. Her ambition was to do something better in her life to support her family. She learned the trade in this short period of time. Now she has established her own enterprise where she is stitches the clothes with new design keeping the recent fashion trends in mind. She is very happy and thankful to Don Bosco Tech for providing such opportunity and for enhancing her skills.